Wittlebee Discount Code for St Patrick’s Day! Amazing Wittlebee Discount Code for St Patrick’s Day! Be quick as this is only valid for 3/17. What is Wittlebee? It is a fabulous way to save on kids clothing! 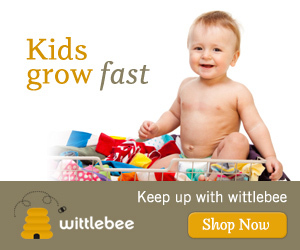 Every month Wittlebee sends you a box with 6 items of kids clothing. The quality is top notch and the value of the clothes can be around $100 with high quality well known sought after brands. The usual cost is just $39.99 per month which we think is a great deal. Use code LUCKY at checkout to get your amazing discount! It’s just $3.83 per item of clothing! Still not sure that Wittlebee is for you? You choose 3 items yourself from the online showroom. Browse and choose at home. This gives you the freedom to choose exactly what you want whilst still having the fun element of surprise for the other items which will be chosen by your personal stylist. The value is still amazing and it is so fun waiting to see what other items are in your Wittlebee Box! And don’t forget our exclusive Wittlebee Giveway to win a Petunia Pickle Bottom Bag! Thomas the Tank or Toby for only $1.49 + 2.95 Shipping!